When last were you involved in a teleconference? We’ll wager that it’s been a while. As desktop video technology has become more affordable and easier to scale, teleconferencing has become a thing of the past. Video conference solutions used to be a communication platform that only senior executives in large blue chip organisations could use in the corporate sector. Execs from different offices across the world would have to utilise a dedicated ‘video conference suite’. This would effectively be a meeting room kitted out with expensive and cumbersome hardware such as zoom-lens pan and tilt cameras, wall-mounted speakers, the familiar desk microphone soundsation and a big ugly box that brought it all together. 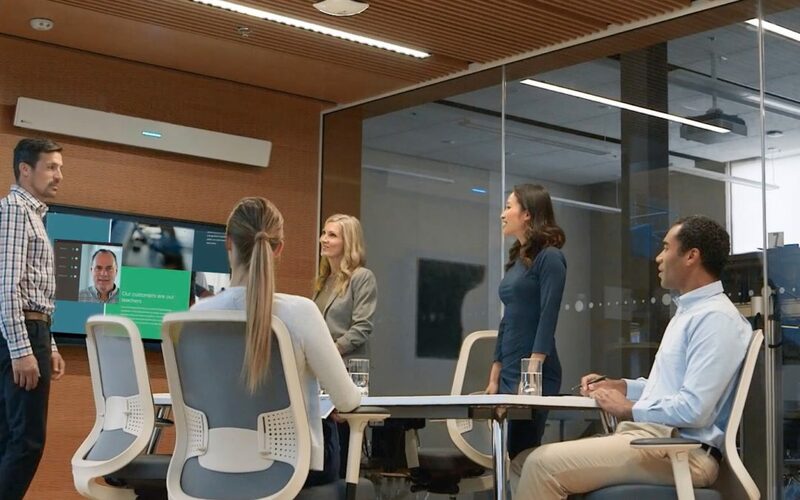 Cisco and Polycom have long dominated this market and continue to do so at the exec video conferencing end with a top spec Telepresence room costing hundreds of thousands of pounds. However, with vastly increased demand webcam technology has become more scalable. Solutions like Skype, Hangouts and GoToMeeting have created a new market for ‘online meetings’. Webcam technology has caught up with the expensive business video conferencing solutions of the past offering high definition video that’s as mobile as you are. With rapid deployment, low entry-level costs and deep integration with document sharing platforms, the uptake of software-based video conferencing solutions in business is growing exponentially. As large corporations turned to Skype for Business to replace the clunky Polycom and Cisco hardware of the past, new hardware players have come into the market with innovative solutions. Microphone technology for online meetings, however, hasn’t had the same revolution that webcams have. Nureva, have honed in on this gap in the market. The HDL300 is a revolutionary new microphone technology designed for medium to large meeting rooms. It uses 8192 virtual microphones and auto calibrates to the size of its meeting room. Gone are disruptions from drumming fingers on the desk, or the peaks in audio quality as individuals lean closer to the desk to speak. The technology knows where every person in the room is (even if they are facing away from the device), delivering a crystal clear experience. The HL300, accompanied by an F-series 84″ 4K captive touch screen from Avocor provides a compelling Skype for Business solution for any large meeting room or boardroom. Mediazest create audio visual systems for a retail, automotive, financial, or corporate spaces, we have the technology and the passion to bring your brand to life. We design, install, maintain and measure our projects so you can focus on what you do best. We’d love to show you how much better your meetings can be. Get in touch..